If there’s one thing electric vehicle owners are learning, it is that extremely cold temperatures are likely going to lead to frustration if they don’t take extra special care of their battery powered vehicles. Look at it as just another added benefit to "saving the world". A new report by Fortune highlights several Tesla owners pointing out their issues: "My biggest concern is the cold weather drained my battery 20 to 25 miles overnight and an extra five to ten miles on my drive to work. I paid $60,000 to not drain my battery so quickly," said New Jersey based Model 3 owner Ronak Patel. 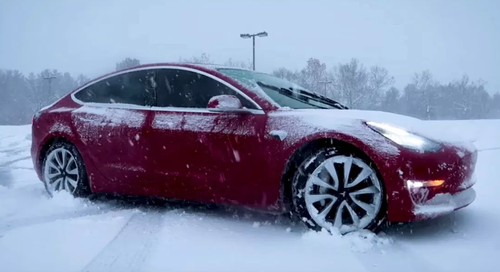 The pro-EV lot over at InsideEVs stated frankly back in December, "Cold weather demands a long range battery" before also encouraging people to shell out more money: "...if you reside in a colder region and can afford to spring for the long-range Model 3, then come winter, you’ll be glad you made that choice." Salim Morsy, an analyst with Bloomberg, stated: "It’s Panasonic that manufactures Tesla batteries. It’s not something specific to Tesla. It happens to Chevy with the Bolt and Nissan with the Leaf." Additionally, the door design that Tesla used for the Model 3 as part of its appeal to be "different" continues to come back and bite owners during the winter. As we previously had noted during a cold spell in Quebec late last year, owners were having difficulty getting their handles out from their recessed spots in order to open the doors to their car. This has left some owners complaining and others writing to Tesla (or even Elon Musk on Twitter) looking for a fix. "Jesus Christ!" Lambert exclaimed about 53 seconds into the video, hands shaking from the cold, upon finally getting his door handle to pop out. Meanwhile, Andrea Falcone from Boston, who bought a Model 3 about two months ago, stated on Twitter: "I can't wait all day for this silly car." As with everything, Elon Musk tweeted that there would be an over the air software update that would address how cars are holding up in cold weather. Given that the company can’t physically readjust door handles over the air, we’re guessing the fix will wind up being something that puts further pressure on an already drained battery. And recall, back in November, we had already reported that Tesla was going to "fix" these issues with a vague software update. In terms of that "fix", it looks as though the only thing that was addressed was the window not always coming down after the door opened. Since there are no door frames on the Model 3 doors, the window rolling down is semi-necessary to help open the door once the handle has popped out. As we stated back in November, we're still waiting for Elon Musk's software update that'll stop cold weather altogether.